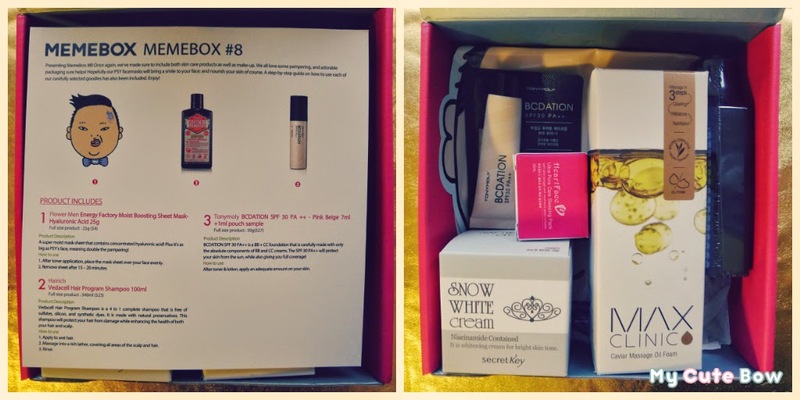 Memebox is a monthly Korean beauty box. 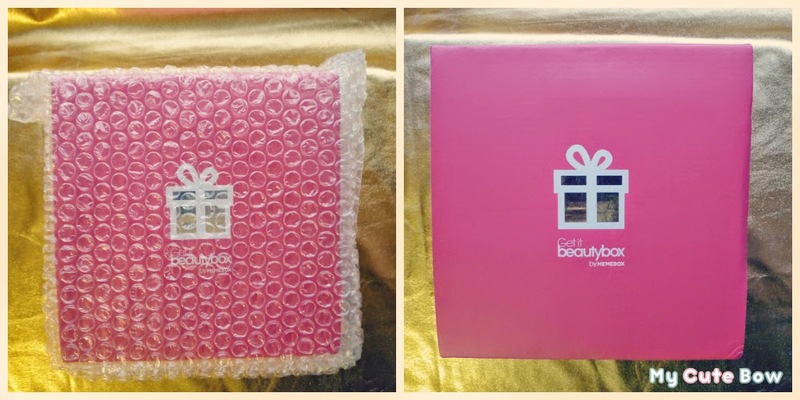 Each box includes about 4-8 full-size products and deluxe samples ranging from skin care, hair and body products, to makeup. What I like is that you don't have to subscribe to it but you can just buy it when you want. The downside is that they sell out quick! When I first learned about the boxes in January, the current box was sold out already! So I waited until the next available boxes came. I received 5 points when I made an account (Looks like they give 2 points now) plus 5 points from using a referral! I mentioned memorable-days.net. It just takes a few days for the points to show up on your account. So that's already $10 off my first order. They used to ship to many countries but as of March 31st, Memebox only ships to US, Canada, and Japan. So I ordered this box on February 13, 2014, right before it sold out. But it doesn't ship until March 25th. What a long waitttt. And I finally got it today on April 7th! So it was about a 2 month wait since I ordered, and took about 13 days to get here after it was shipped. I was going to wait until I got my first box to see how I like it, before I order any more. 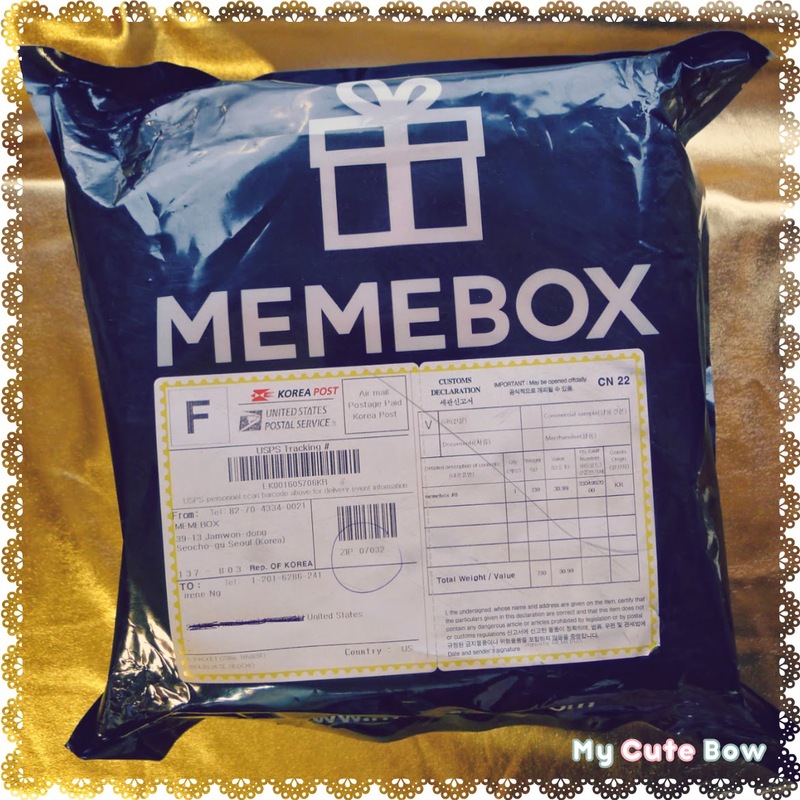 But MEMEBOX often has promotions such as free shipping and free points, so I got tempted into buying another box! Somehow I had already accumulated 15 points to use towards my next order, so I quickly purchased Box #11, I'll be reviewing that one once I receive it! Inside they provide a card listing all the products inside and a short description. This box had a total of 6 products, with 3 of them being full-sized. 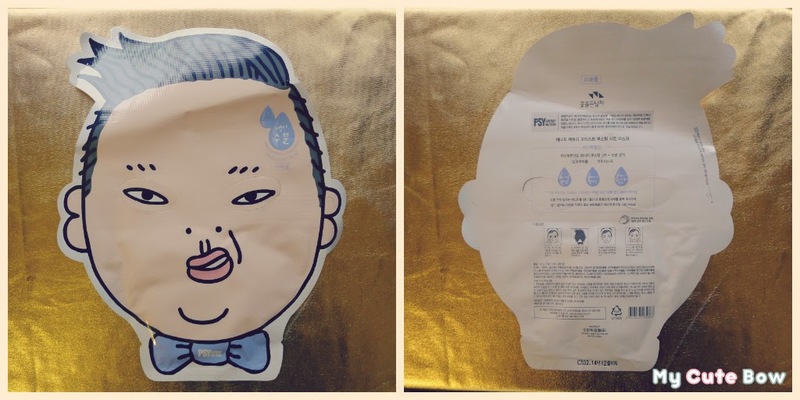 Haha this is strange but funny, the packaging has a picture of PSY's face. Is this for men to use?...i am not sure o.o But I do love masks and products with hyaluronic acid. I currently use Juju aquamoist hyaluronic acid cleansing foam, and hear great things about hada lado hyraluronic acid products. This active ingredient helps skin retain moisture and keep hydrated. This is a 4 in 1 complete shampoo that is free of sulfates, silicon, and synthetic dyes. It is made with natural preservatives. This shampoo will protect your hair from damage while enhancing the health of both your hair and scalp. I don't really care too much for hair products, but this is a pretty nice size and cool to try. It smells a bit medicinal. This is a BB + CC foundation that is carefully made with only the absolute components of BB and CC creams. The SPF 30 PA++ will protect your skin from the sun, while also giving you full coverage! They have BB + CC combination products now? I'm not surprised. I love using BB or CC creams on a regular basis when I don't want to wear a lot of makeup, so i'm definitely happy about getting this product to try. I tested a little of it, and it seems a bit thick, but blends in my skin. It also smells good. 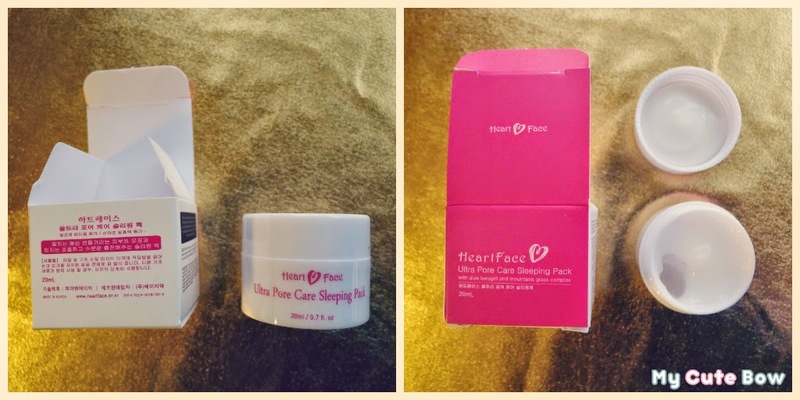 This is a sleeping pack that keeps your skin moisturized all night long. Additionally it minimizes your pores and controls sebum production while you're sleeping! Contains aloe vera gel and other plants, also hyaluronic acid! After washing your face, massage this sleeping pack evenly on your skin before you sleep. 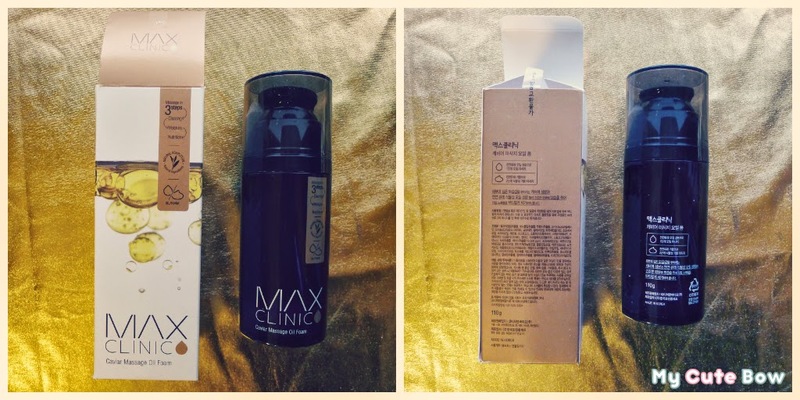 I love asian skincare products so much! I'm really glad this one targets pores and acne. I have large pores, combination and acne prone skin, so I think this would be very suitable for my skin type. Tried a little on my skin, and it absorbed very well and feels moisturizing. 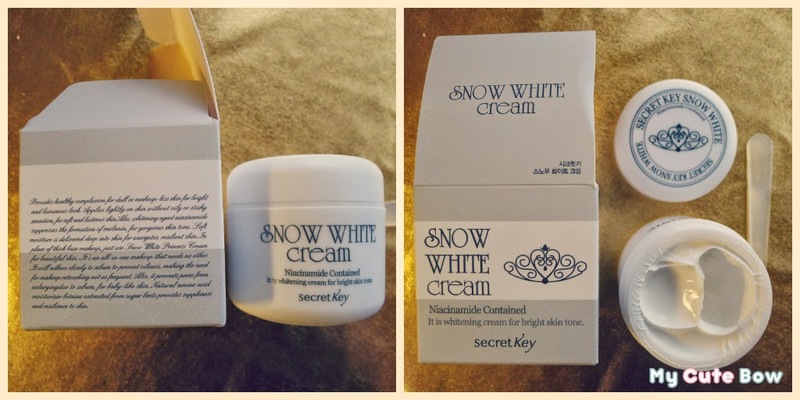 This is a whitening cream that brightens your skin tone. It provides instant coverage light enough to allow your skin to allow your skin to breathe. This cream is free from mineral oils, benzophenone, phenoxyethanol, and artificial pigments. From the description on the box, it sounds like this product is great to use if you don't want to put on a lot of makeup but still give your skin a luminous look. It also focuses on controlling sebum and prevents pores from enlarging. Yay another skin care/makeup product to try and its full-sized! I haven't found any whitening products that noticeably whiten my skin. It might be because i'm pretty tan, or I just don't notice lol, but I always like to try a new whitening product and hope! This feels a little sticky and smells powdery fresh. Comes with a little plastic spoon so you don't have to touch with your hands. This is a rich and nourishing cleanser that is made from caviar oil. It rapidly dissolves dirt and makeup in a single cleanse. It will help you deep cleanse your pores and remove sebum. 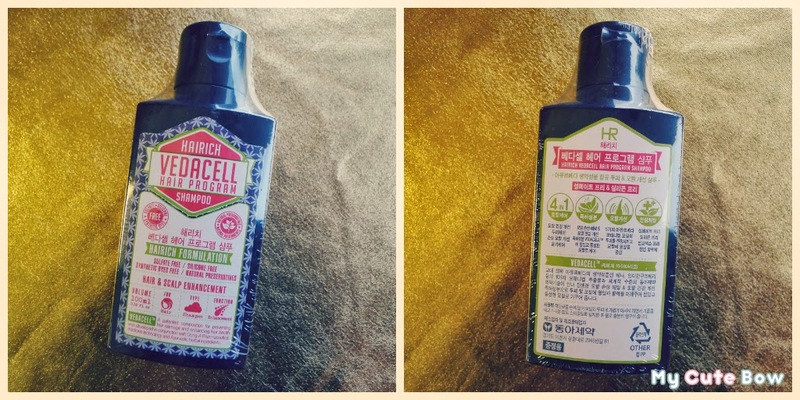 It massages in 2 steps: clearing, moisture, and nutrition. Wow, $73? Seems pretty luxurious. I would never buy such an expensive face cleanser myself, so this is pretty cool to get a full size product of. I am very happy with my first MEMEBOX. The products in this box have a total value of $127.52. Well worth the $20 I paid ( ^_^ ) It contained a good mix of skincare and makeup, but nearly all for the face-skin plus the shampoo. And a focus on sebum, pores, and whitening haha. MEMEBOX #12 is now available, so get yours before its sold out!